I first want to announce the winner of the $300 Target Gift Card Giveaway, the winner is Katie Hanson!! Congrats! Please email me at lilyac13@gmail.com to claim your prize! I am having a really hard time not shopping right now, I want so many things, but I'm trying to save some money up for Black Friday! But its extremely difficult for me haha..here are some things that are tempting me. And I wanted to share with y'all something that I have been working on with 4 other bloggers, Bloggers Give Back. We're working together to raise money for two little boys battling cancer. 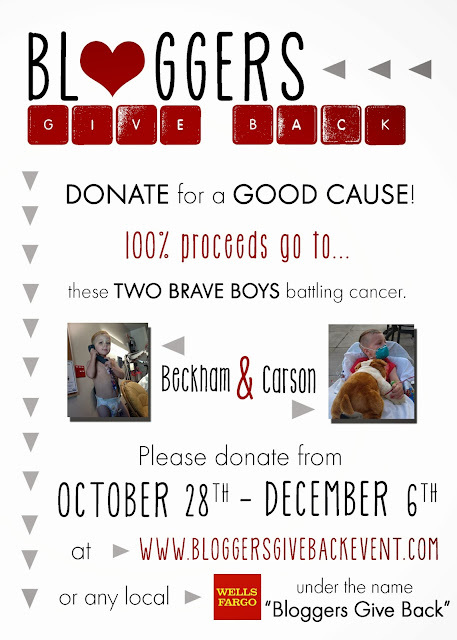 Beckham and Carson have heartbreaking stories, you can read their stories HERE. We're trying to raise money to go toward their medical expenses and for their Christmas' this year. But even if you don't live in Utah you can still donate and make a difference in these boy's lives!! Even if its just a $1 it can make a difference! You can donate on the website or at any Wells Fargo Bank, under the name Bloggers Give Back. How much did the event end up raising?